Monday to Friday 8:00 to 20:00 hrs. Saturdays from 8:00 to 14:00 hrs. Cardiological consultations to timely detect heart disease. With us you will have specialized care in the early detection, prevention and treatment of cardiovascular risks and diseases. The support we get from our specialists in various areas of cardiology is unique in that we also have the latest technology in studies designed to rule out various heart diseases. Our mission is to provide effective care in the detection and treatment of cardiovascular risk factors and accurate diagnosis of cardiovascular diseases in the context of an ethical medical practice. We have the support of specialists and sub-specialists in all areas of cardiology, as well as infrastructure and cutting edge technology for laboratory and clinical studies in the field. Our goal is to become a reference center in Mexico City for the early detection and treatment of cardiovascular risk factors and cardiovascular diseases, supported by state-of-the-art technology, and provide our patients with diagnostic accuracy, integral and specialized care within our facilities. 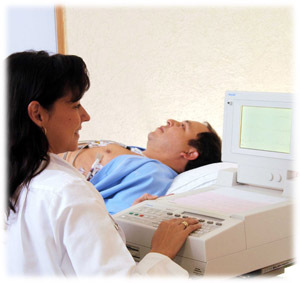 We have specialized physicians such as cardiologists, specialists in adult and pediatric echocardiography, cardiac rehabilitation specialists and cardiovascular intervention specialists, all certified by the Mexican Board of Cardiology. We have the latest equipment for cardiovascular paraclinical studies, which are performed by a specialized cardiologist in the field. Once cardiovascular risk factors are detected such as hypertension, diabetes mellitus, dyslipidemia (cholesterol and triglycerides), obesity / overweight among others, they will perform a customized assessment of cardiovascular risk and if necessary, studies to detect cardiovascular diseases in a timely manner. If necessary, patients are referred to specialized areas of our hospital and treatment will be initiated by one of our specialists. Detection of coronary abnormalities, resulting in problems of angina pectoris and myocardial infarction, the leading cause of death in our country and developed countries. After the screening the patient is referred to comprehensive care within our hospital complex. Detection and treatment of the consequences of these diseases at a cardiopulmonary level. Detection of problems, electrical in nature, i.e. different types of arrhythmias (abnormal heart rhythms), which may or may not accompany structural diseases. And overall, detection of all types of heart disease for prompt attention. Preoperative evaluation for detection of cardiovascular risk. It is done by appointment at our facility. The evaluation consultation is performed by a specialist in cardiology and is complemented by paraclinical and laboratory studies, issuing a final report addressed to the treating physician. Taking resting electrocardiograms. The screening does not require fasting or any special preparation, and is performed on the spot during our hours of operation. It forms part of the preoperative evaluation for detection of symptomatic arrhythmias or when a patient has one of three factors of cardiovascular risk and wish to rule out problems of coronary insufficiency. Treadmill exercise stress test. Different protocols are performed according to patient characteristics. It is given to patients in order to rule out a problem of coronary insufficiency based on symtomatology in which the resting electrocardiogram is normal, as long as the patient is stable and an acute cardiovascular event has been ruled out. It also has instructions for specific case screenings and classifications of cardiac arrhythmias. It requires fasting for 8 hours and stopping certain medications used to control blood pressure and other heart conditions (beta blockers) at least 24 hours prior, under medical supervision. Transthoracic echocardiography. It is a noninvasive ultrasound test that allows us to observe in real time the structural state of the heart, and its movements. It is given to patients with cardiovascular risk factors as part of a comprehensive evaluation, and regular testing in the evolution of heart disease and the search for other cardiac conditions suspected due to clinical testing(disease of the heart valves). An appointment is required. Pharmacological Echocardiography. It is a sophisticated test that is used mainly in the search for coronary disease, when the stress test cannot take place or when it does not provide enough information. It is also used for tracking once a problem of coronary obstruction has been identified and in very specific cases of complex cardiac diseases. 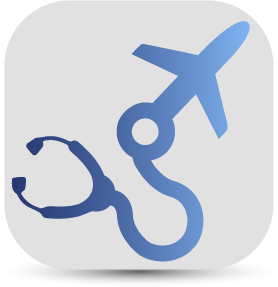 An appointment is required before testing, as well as an 8-hour fast and suspension of certain medications for heart problems or management of blood pressure (beta blockers) under supervision of the attending physician. Holter. It monitors the heart rate and rhythm for 24 hours. It is a test which performs continuous cardiac monitoring for 24 hours, and is used in the search and evaluation of cardiac arrhythmias. It does not require fasting and an appointment is needed. 24 hour continuous ambulatory blood pressure monitoring. It is used in search of Hypertension and in patients with a previous diagnosis of hypertension who are undergoing treatment, to stratify adequate control. It does not require fasting and an appointment is required. Our clinic works with other areas of the hospital to provide you professional and comprehensive treatment and therefore has the support of specialized hospital areas such as Cardiology Coronary Care Unit, Intermediate Therapy, Emergency angiography, within the same Institutional complex. This is in order for you to feel confident that several areas are working for your health.